Welcome to Out in STEM Arlington! At our first meeting of the semester you will be introduced to our officers and learn all about what we have to offer! Out in STEM is focused on the enrichment of UTA's LGBT+ students in the fields of science, technology, engineering and mathematics. In our meetings you will find career opportunities, community engagement and friendship! 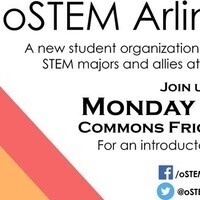 We look forward to meeting you in order to make the UTA campus and the broader STEM community more inclusive for gender and sexuality minorities.